Boston has made great strides in recent decades to improve traffic flow and reduce motor vehicle accidents, but it’s clear there is still work to be done. In 2014, the last year for which comprehensive crash data is available, 1,279 pedestrians and bicyclists required emergency medical treatment due to motor vehicle collisions. 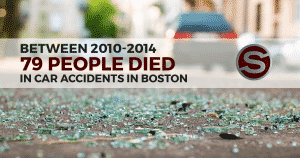 Between 2010 and 2014, 79 people died in car accidents in Boston. In response to these tragedies, and in recognition of Boston’s changing population, the city is reshaping its transportation future with Go Boston 2030, a broad framework of research-based initiatives focused on improving traffic safety and transportation access. Two key components of Go Boston 2030 are Vision Zero Boston and Neighborhood Slow Streets. 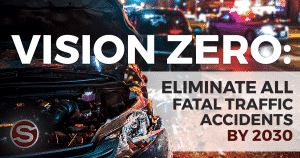 Vision Zero Boston was the first major program implemented by Go Boston 2030, and one of its goals is to eliminate fatal traffic accidents by 2030. Boston is among a number of major U.S. cities adopting a Vision Zero plan. In 2015, the Vision Zero Task Force, led by the Boston Transportation Department (BTD), conducted research to prioritize issues and locations to focus the city’s resources. The task force identified two priority corridors: Massachusetts Avenue, one of the city’s most heavily used thoroughfares, and Codman Square, a commercial and residential hub in the Dorchester neighborhood. Research indicates that arterial roadways, such as Mass Ave and the streets that border Codman Square, are disproportionately dangerous for all modes of transportation. Arterial thoroughfares are especially dangerous to pedestrians and bicyclists. Neighborhood Slow Streets is one example of how Boston seeks to reduce speeding, improve safety and engage the community. The Slow Streets program emphasizes low-cost, quick-install solutions to encourage drivers to slow down; for example, more signage regarding speed limits and pedestrian crossings, speed bumps, and better lighting in areas where pedestrians or other vehicles may not be easily noticeable. The Slow Streets program allows neighborhoods and communities to apply directly for traffic-specific solutions. This involves a bit of coordination: Applicants must collect evidence and solicit community stakeholders (e.g., neighborhood associations, police precincts, schools, etc.). The applications are reviewed by the city and new partnerships are announced based on a scoring system. The city plans to reopen the Neighborhood Slow Streets application process in early 2018. 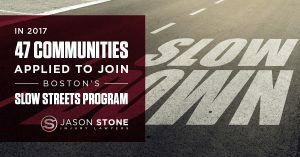 If you were hurt in a Boston-area wreck caused by another driver’s negligence, the attorneys at Jason Stone Injury Lawyers are ready to help you get the compensation you need to recover. Call us at 800-577-5188 or contact us online; we offer free consultations in person or by Skype, FaceTime, or Google Hangouts, and we’re the only law firm to provide the Stone Cold Guarantee®. For updates on Boston traffic initiatives and personal injury law, “like” Jason Stone Injury Lawyers on Facebook, or follow us on Twitter.